First time borrowers and recent graduates may be concerned with student loan debt and their credit score — arguably one of the most important financial numbers of your lifetime. 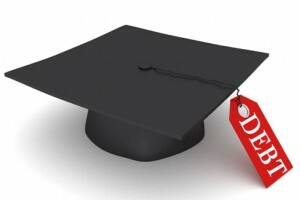 With this in mind, it is important to know your score and how education loans can impact your score. I’m not suggesting that loans aren’t worth it — as investing in yourself and your education is one of the best things you can do — just that loans should be treated responsibly and that financial education is power. Here we go! You credit score — or FICO score, as it is sometimes called — is used by lenders to determine your credit worthiness for taking on debt. The formulas used aren’t standard science, but generally speaking your score is determined by how much debt you have, whether you pay it on time, have derogatory marks (such as an eviction or a bill in collections), your debt to income ratio and length of credit history and other factors. Typically the higher your credit score, the more competitive the interest rate you will receive. Even though a number of “hard” credit inquiries can often be seen as a negative to lenders, borrowers should still shop interest rates in order to save the most money over the lifetime of the loan. Technologies such as Achieve Lending allow users to shop multiple loan offers in as little as 30 seconds, without a hard pull on their credit to aggregate the loan offers. Depending upon the interest rate and the amount of the loan, a difference in 1 point could save borrowers thousands of dollars! The money you save on interest can be used to launch a business, fund your retirement account, or make a down payment on a home. Think about it! Student loans will appear on your credit score the minute you sign for them and receive money, however once you graduate and start earning an income, your credit score (and ability to qualify for new credit such as car loans and mortgages) may be impacted depending upon how much money you took out for school. Credit scores are impacted by credit utilization and debt-to-income ratio, meaning if you have a large amount of debt and a relatively low income, you may not be able to qualify for other types of credit, or if you do it will come at an obscenely high interest rate. Even though student loans are typically considered the “good” invest-in-yourself kind of debt, it still should be treated responsibly. Borrowers should do what they can to always pay on time, pay off the debt as quickly as possible, or take advantage of consolidation or refinancing in order to save the most money. Even though credit can often seem ambiguous and difficult to understand, the choices you make in your youth may significantly impact your financial future as a post graduate. You’ve already taken a great financial step by investing in your education; make sure to keep your finances in tact by maintaining a healthy relationship with credit. for a forty five minute consult!